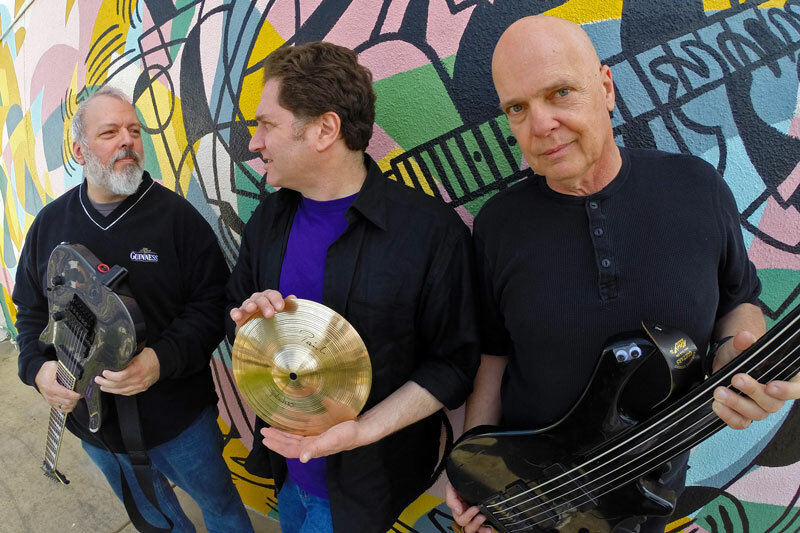 Me at left, Gregg Bendian in the middle, and Doug Lunn at right, during a photo shoot in Leucadia, CA on March 18, 2014 at 11:45am. Doug Lunn set me free in 1992. I thought I knew how to do jazz-inspired improvisation in a rock context prior to then, but it was only when I placed myself in his guiding hands (in tandem with Toss Panos) that the horizon began to reveal itself. I was honored to have Doug and Toss play on my debut album hat. in 1992, along with a number of other wonderful players. When I decided to take to the stage in support of that album, Doug and Toss were the people I chose to use, and in rehearsals in Toss’ backyard studio I saw how my songs as recorded were actually just blueprints – in their expert hands it was revealed to me just how far into the stratosphere these strange little songs could be piloted. I had done some jamming out with my own bands in the eighties, and been involved with some pretty crazy free improv episodes during Zappa ’88, but when I got in a rehearsal room with Doug and Toss there was a palpable sensation of new ground being broken in practically every song I played with them. Toss played with time in the most engaging way imaginable and made me feel that all rhythmic possibilities were valid. But it was Doug’s fearless harmonic underpinnings that opened my eyes, ears and sensibilities wider than I’d ever thought possible. This is actually the improv section from an alternate version of “We’re Rockin’ All Night With The Tangy Flavor Of Cheddar.” It delighted me to the extent that I edited it out and turned it into its own track. It’s like one long bar that shifts, stretches, contracts and congeals, then breaks down and rebuilds itself. Doug and Toss are in charge of constructing the skeleton and I’m left free to explore any avenue I desire on its bones, with utter confidence that they will not let me fall. I’m so grateful for this song because I think, more than any other single recorded example, it brings back to me the way it felt to play with these two gentlemen and have musical mysteries revealed, peeled back and solved simply by way of their example. We did some unbelievable gigs right off the bat. The full video concert on the DVD that comes with the 2007 hat. Special Edition reissue will give you some indication. On Dust Speck we had a little more time in the studio to experiment and I was delighted to utilize Doug more extensively in the orchestrations. He told me about the Mick Karn approach to bass recording: double-tracking the bass part with one fretless bass and one fretted bass. His work on the song Blameless is just so beautiful. This was the song where a part of one of the bass tracks – just a couple of bars – was accidentally erased, and Doug made the drive from LA to San Diego without hesitation to fix it. This was back in the firmly analog days – there was no feasible way to patch in his part from another section of the performance, it had to be replayed. This act of unquestioning generosity is entirely indicative of what sort of a person Doug was. He contained such reservoirs of selflessness and giving. It’s humbling even to be inspired by him. Doug was a master. Not only as a bassist, although his voice on that instrument was unparalleled – he could throw down brilliantly on drums and piano and more besides, and had a compositional sense that was so confident and cool and surprising and breathtaking. Actually he was one of the best and sophisticated composers I ever had the honor to meet. I hope that more people will discover his Doug Lunn Project album. It is a tour de force. Here’s a live arrangement of one of that album’s songs done at a recent Keneally/Bendian/Lunn gig: Dyslexia Mango Nixon. Doug and I could talk for ages about Miles, Coltrane, Monk – he knew everything about this music that there was to know, and I learned so much from these discussions. It was a privilege to place myself under his tutelage – I somehow felt that he had a direct line to the source of this music. I have an especially fond memory of having played Coltrane’s “Crescent” at the Baked Potato, with Doug, Rick Musallam and Chad Wackerman. I only wish that we’d been able to do more gigs with that lineup! In recent years it was a pleasure and an honor to work with him a lot more often, often in partnership with our brilliant friend Gregg Bendian. Here is a little segment from an idyllic afternoon spent practicing in Scott Chatfield‘s living room: Out On The Tiles. That flowing bass tone starting at 3:27 – double-tracked in the classic Karn style – feels like a river of stars to me. Doug was a beautiful, honorable, elegant, smart, brilliantly funny, just-cynical-enough and eminently wise man. I ache for his loved ones in the wake of his passing. I am grateful he no longer suffers. I love him so much. Previous Post:Much New Year’s News! Next Post:MK/BFD tour the Northeast (plus Texas)!